Hi guy's. Numpty question but I'm a newbie with these fancy swivel housing things. I've got a leaking swivel housing. Smells like gearbox oil running out on to the tyre. I've never had a swivel housing before so dont really know whats involved . Are they hard to replace ? Is this a garage job or a sunny weeked on the drive with plenty of tea ??? Thanks in advance for any replies. But, it could be a couple of things.... Do the chrome (or possibly black) swivel balls on the end of the axles look corroded? or is the swivel seal definitely leaking. As EP90 oil on the tyre could also be the hub seal leaking too. There is some pitting on the chrome swivel ball. The leak has only just started tho so I wouldnt have thought it would be that. Can i check the hub seal without dismantling everything ?? I've just found a post, ( u.s. forum ) saying to drain the oil and re-pack with grease ???? Any thoughts ? If there is pitting on the ball then its really time for a new one. You can bugger about and smooth/fill the pitting, but you're just eeking out life from the old one. Having thought about it, it is unlikely to be oil in the wheel bearings, and therefore coming out from the hub seal. Can you see any oil traces coming down from the centre of the brake disk (axle side). You can change the oil in the swivel for 'one shot' grease. Put in by Land Rover as its thicker and therefore less likely to leak. Personally I think its a silly idea, I want to know when its leaking as leaking means water etc can get in. I did my Disco about 4 months ago (same principle) takes about 1/2 a day, it's a logical dismantle, my parts cost me £35 roughly (that's a selection of shims, bearing, all the gaskets and one-shot grease). the preload is nothing hard, just frustrating when you can't get the right combination (the preload is the resistance to movement of the swivel, done with the seal removed). You add or remove shims from the top pin until the preload is correct. I not get the britpart kits, just get the balls from them and go bearmach for the rest of the bits. Then you know they will be the correct shape/size/not made of cheese. Also, for both the Defender swivels and in fact both Disco ones, when I think about it, there was some pitting, but not enough to worry about. I changed all the seals and bearings, but not the balls and I've had no problems. If the balls are pitted then water and dirt can get into the CV joint inside the ball, so think about replacing the balls, new ones (very expensive) or good SH ones from a wrecker that arent pitted will be the go. In any case the edges of the pitting will only eventually damage the lip of the new seal so the best course of action will be to replace them. To set the preload go to your nearest fishing tackle shop and buy an inexpensive spring scale that will weigh 0 - 2 Kilo's - the preload setting is measured by the amount of force the spring scale uses to move the ball joint with the steering arms disconnected and before the seal is installed. The one shot grease replaced oil in or around 1998. I want to say my preload is more like 4kg? But that could be because mine is a top bush not bearing. Thanks guy's I'll let you know how I get on when weather and funds allow. Ok, update. I.ve had a better snoop about with the wheel off, ( fitted 50mm wheel spacers and 50mm wheel arch extensions ) Gear oil is gushing out onto the back of the brake disc, ( explains the **** braking lol ) axle side. Am I right in thinking hub oil seal then ?? Balls are pitted and there is a slight leak so they will have to be changed anywho's so I'll do the both at the same time. In the mean time is this oil coming from the front diff housing so i know what to keep topping up ? On a diffrent note. Anybody thinking of spending £600 on wheel spacers and extended arch's think long and hard cos I dont know if its £600 worth of improvement if you know what I mean. I wouldnt do it again put it that ways. Should have got the gas sorted out instead. Must leave ebay alone when I have money in my pocket !!!!! If its from the back of the brake disk then yes its probably the hub seal. Wouldn't normally get oil from the hub oil seal as it would be grease in the bearings (says he with his rear bearings in oil). Sorry for the delay guy's, been waiting for parts. Just started full strip down and I've come across a problem. I've removed the stub axle as I'm replacing it, ( It's mangled ) but there is a bearing, a seal and what looks like a brass nut on the back of the old one but not on the new one. All the haynes says is " take it to your dealer ! " Is this something I can do or do I need to take it to a garage to get done while looking sheepish ? Also alot of scoring on the half shaft but no sign from where ? Doh ! Thanks Bowie. What about the scoring on the half shaft ? 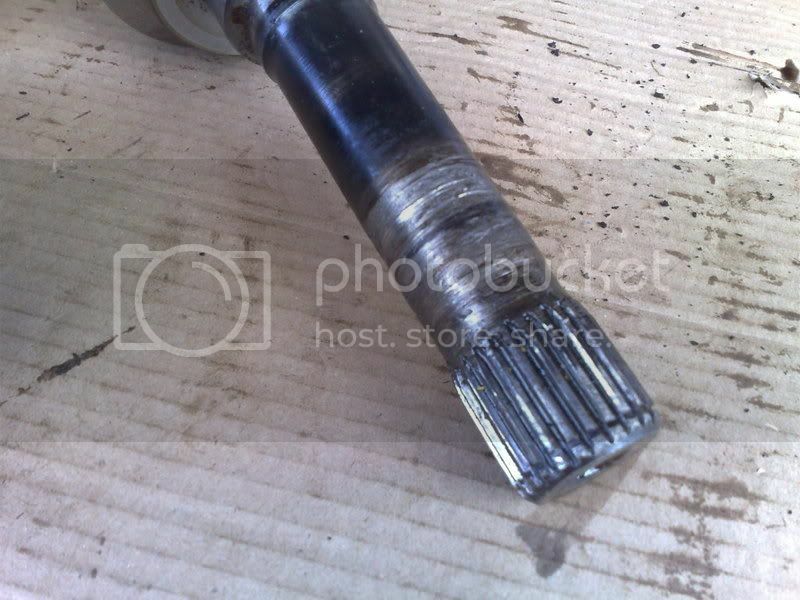 Looks as tho its been rattling around in the stub axle but inside the stub axle is ok ? Is there something else I need to replace ? I'm struggling with that one, maybe it was just a loose drive flange? 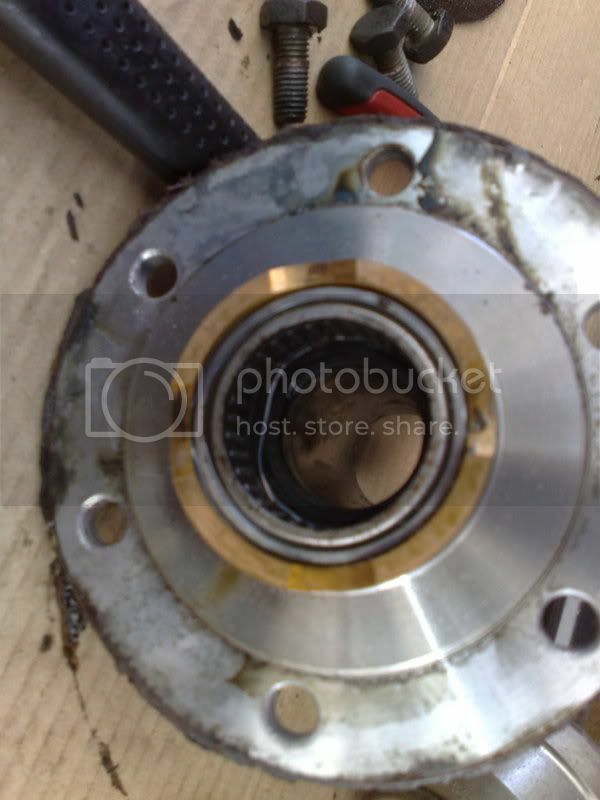 Look inside the old stub axle, is there a bearing at the outer edge as well? There isnt normally a bearing at the outside as well. My guess would be loose flange or a bit of carp in there being swung about. Houston we have a problem . The bottom pivot bolts wont budge. I've managed to snap 5 torx bits and mangle one of the bolt heads. I removed the housing by removing the top swivel point and removing from the top first. Can I get away with this on refitting after changing the ball and bearings ???? I'm stuck otherwise. As long as the pin is a reasonable fit on the inner bearing race you don't need to replace it, I have had the same problem as you before and left it in there with no adverse side effects. Remember they are slow speed bearings, but load bearing, so actual fit on the pin is not super critical, even if it was loose on the pin you could pock mark it with a punch to stop the inner race from spinning on it. If the wheel bearings died at some point could there have been enough movement for the cv to rub on the inside of the stub axle?